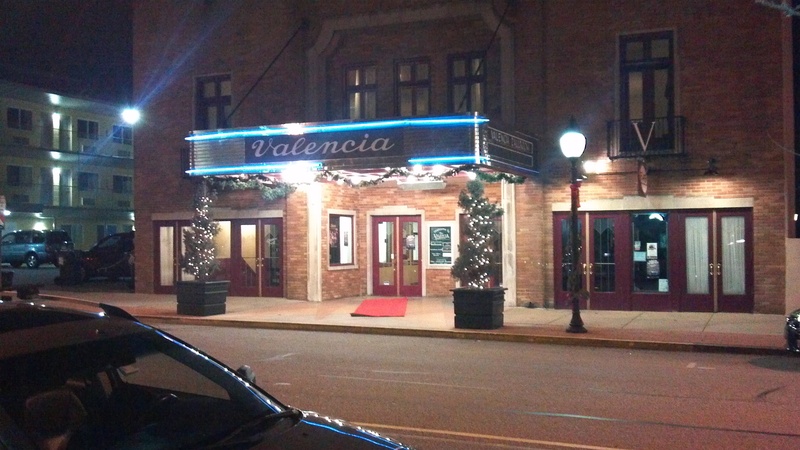 New Year’s Eve at The Valencia! 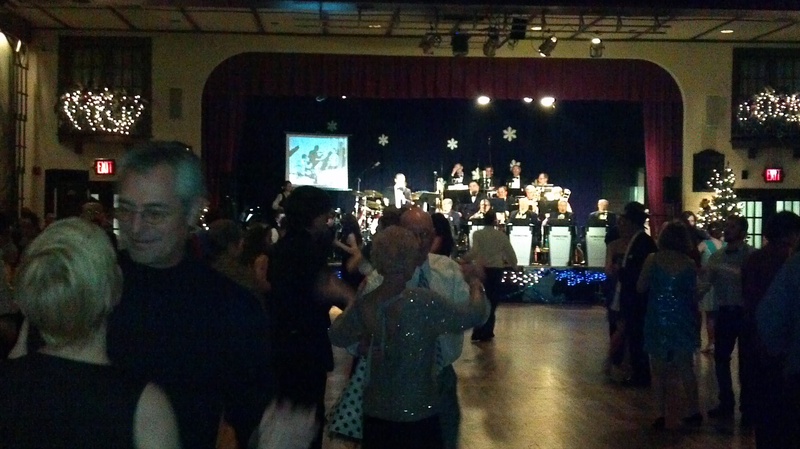 New Year’s Eve at The Valencia Ballroom in York, PA, with our friends Al & Margo Smith, proved to be a wonderful event, but when sponsors stated that we would “swing in the New Year,” they weren’t kidding. The building itself provided a perfect atmosphere. The Valencia features the same decor as it did when it opened in the early 1930s and featured big bands led by such luminaries as Jimmy Dorsey and Benny Goodman. Entering the ballroom was like walking onto a movie set and we ate dinner on the balcony overlooking the dance floor. The dinner itself was delicious and featured roast beef and chicken with redskin mashed potatoes, green beans, salad, and a desert table featuring four different pies. A cash bar with very reasonable prices provided drinks and none of the 260 people in attendance appeared to have over-indulged. Dinner was served exactly at 7:00 and the half-hour dance lesson began at 8:30 with the band beginning promptly at 9:00. Unforgettable Big Band, a 17-piece orchestra sounded fantastic and kept the evening moving. In fact, when the big band finished a set, a combo stepped up and provided continuous dance music. There was decent room to dance. As long as you were doing a swing! The sprung dance floor indeed made it easy to dance all night. That was my first time on such a floor and I awoke to absolutely no leg fatigue whatsoever. We would have rated the evening perfect, especially since the cost for the two of us was only $60.00 (yes, you read that correctly–that was the cost for a couple’s ticket) except that when our hosts, the York Social Dance Studio said that we would swing in the New Year, they meant it quite literally. YSDS is primarily a swing studio and when the band played a fox trot, everybody did a swing. Martha and I fit in two or three rumbas to fox trot tunes–while everyone else did a swing. The band played one cha-cha, one waltz, and one tango and there were people there dancing swing to the tango, that is those people who didn’t abandon the floor, which was the majority. Great food, a romantic setting, a pleasant crowd, and a talented orchestra made for a fun-filled evening, but the lack of dance variety was a serious drawback. I love swing music, but I’ve only got so many moves; certainly not enough to spread over four hours! This entry was posted in Uncategorized and tagged New Year's Eve, New Year's Eve in York PA, swing dancing, swing music, The Valencia Ballroom, York Social Dance Studio. Bookmark the permalink. 8 Responses to New Year’s Eve at The Valencia! Love your enthusiasm, Bonnie! We talked to a very pleasant young lady who’s an instructor and she said that Tuesday night is ballroom dance night. In other words, they have one group class per week on one ballroom dance!! There were some good swing dancers last night, but we went to the front and held our own with our EC swing and that’s a testament to our instruction. Yes, we have EXCELLENT instruction. We’re held to a pretty strict discipline (once we reach a certain level) … and that is that accuracy of footwork is stressed along with perfecting one’s dance frame and creating a beautiful line … which often involves a lot of contra-body-movement to be reckoned with. There is NOTHING simple about beautiful movement in ballroom dancing done correctly, as you know. I merely state it for people who don’t dance … VERY COMPLEX and very demanding … done correctly … requiring absolute muscle control as one progresses to higher levels. It’s also a lot for one’s brain to keep track of too. Like any athletics, Bonnie, you have to think about what you’re doing until you no longer have to think about it! Sounds (and looks like) you had a great time! Sure beats my New Years Eve. Blood work at GBMC at 6 am, worked from 2 pm until 10 pm, visited with my Brother & Sister in law until it was time to bring in the New Year, then crashed at their house overnight. That was the extent of my excitement! It was all the “Swing” that I could handle! That’s a long day, Don. Glad you got to at least see midnight. Remember the New Year’s MYF sleep-in?! Wow! What a memory that was! Do you remember if we actually slept? Knowing us we probably didn’t! I know that I didn’t!